Jamie Balfour-Paul has practised magic since he was a boy but in his spare time while working as a professional humanitarian in programming and campaigning for most of the last thirty years. In early 2016 he started working full time as a magician. Jamie is primarily a Humanitarian Magician for children (adults are also possible) – mostly refugees (the majority Syrian, as well as Palestinian and others) but also Lebanese. The initiative is motivated by the smiles and joy on the children’s faces – hence Magic for Smiles. Private functions including for adults are also however possible for birthdays and events in homes, restaurants and clubs, and subsidise the humanitarian shows. Jamie uses the stage name of Jamie Jibberish – as appropriate – given that he makes considerable use of magic language in the shows. The humanitarian shows normally last 40 minutes and normally children between 7-13 years old attend, mixed in age due to the high numbers of children – older children also better understand the task required in some of the tricks. Normally the children sit on the floor to create a more relaxed atmosphere. Partners are mostly local and international NGOs, in some cases with the facilitation of the UN. These partners engage with children through protection and psychosocial support (PSS) programmes, and informal and/or formal education. Jamie encourages the integration of magic into programming. 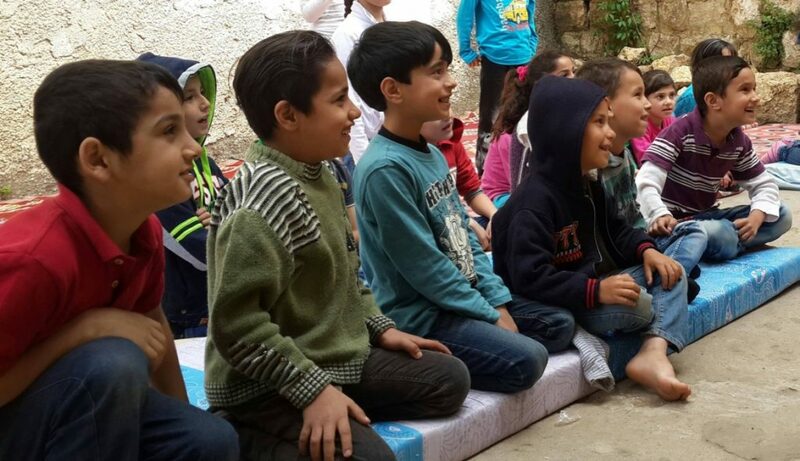 These shows happen across Lebanon in schools and activity centres, in or outside refugee camps and informal settlements. More than one show can be provided per organisation for different groups of children. Follow up shows over time and selective teaching are also possible. Two animators/teachers are recommended to attend per show in case the children get too excited. The venues need to be sizeable for around 50 children with good lighting and space for volunteers to come up to the front. The shows are conducted in Arabic. On the spot evaluation with the children and staff is a requirement as part of ongoing research on the potential of magic especially within PSS programmes. The facebook page @MagicForSmiles gives more idea of what is on offer (face photography is not always available), and partner organisations are encouraged to post short reviews of shows. The project started as a pilot in early 2016 and was largely voluntary; a negotiated fee has since been introduced for most humanitarian shows, and special offers are also available. Discounts are provided for multiple shows. Private or commercial functions are more expensive in order to help subsidise the humanitarian shows. Interested organisations and individuals are most welcome to take this further. Jamie can be contacted on magicforsmiles@gmail.com and mobile +961 76045717. He is based in Lebanon though travels periodically.